Saudi Arabia rarely jokes about money. So investors can’t easily dismiss a threat that the kingdom will dump its American assets if the U.S. Congress passes a bill allowing victims of the Sept. 11, 2001 attacks to sue it for damages. Though a fire-sale would be devastating, it suggests the alternative – an Iran-style freezing of assets – would be an even worse outcome. The holdings, mainly in Treasury securities, represent Saudi Arabia’s last line of economic defense to lower oil prices, which have weakened its finances. Last year the kingdom ran a budget deficit equal to 15 percent of GDP. If oil prices average $30 per barrel over the next five years, it would need to borrow $580 billion to cover losses, Citi estimates. That’s almost equal to the remaining reserves at the Saudi Arabian Monetary Agency, or central bank. SAMA, which also acts as a form of sovereign wealth fund, has sold assets to offset a steep decline in oil revenue over the past year. The size of its reserves has fallen by 17 percent to $593 billion in the year to February, according to its last financial report. At this rate, Riyadh could burn through most of SAMA’s booty by 2020 unless crude rebounds. Without access to those funds, the Saudi royal family would struggle to keep the peace at home. That is why Al-Jubeir’s threat is not to be taken lightly. Sure, jettisoning assets on this scale in a hurry is incredibly risky. The Saudi riyal is tied to the dollar, and a rapid exit would test the central bank’s ability to maintain the currency peg. A hurried sale could also freak out global financial markets, too, which might further squeeze demand for oil. That Riyadh is willing to ponder such a messy outcome suggests just how existentially it needs money to keep its hold on power. That’s perhaps the scariest message from the whole kerfuffle. U.S. President Barack Obama (R) meets with Saudi King Salman bin Abdulaziz in the Oval Office of the White House in Washington September 4, 2015. 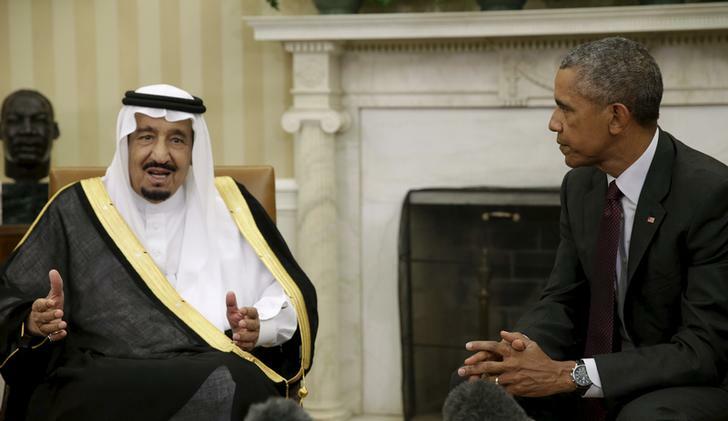 The U.S. White House expressed confidence on April 18 that Saudi Arabia would not follow through on a reported threat to sell U.S. assets if Congress passed a bill that could hold the kingdom responsible for any role in al Qaeda’s Sept. 11, 2001 attacks. The New York Times reported on April 15 that Saudi Foreign Minister Adel al-Jubeir told U.S. lawmakers that the country would be forced to sell up to $750 billion in Treasury securities and other U.S. assets in response to the bill if it passed. White House spokesman Josh Earnest said President Barack Obama did not support the legislation and would not sign it. The bill would allow the Saudi government to be sued in a U.S. court for any role in the Sept. 11 attacks. “I’m confident that the Saudis recognise, just as much as we do, our shared interest in preserving the stability of the global financial system,” Earnest told reporters. Obama, who is traveling to Saudi Arabia later this week, said he opposes the bill because it could expose the United States to lawsuits from citizens of other countries.